When I was in the ninth grade, an English teacher told me that there are three kinds of stories: man versus man/society, man versus self, and man versus nature. The Grey looks to be drawing heavily on the third archetype. Yet despite this novelty and its reasonably original premise (that is to say it isn’t a sequel, reboot, or remake) I hadn’t even heard of this movie before I started researching today’s post. The Grey, scheduled for a North American release on January 27, 2012, is Joe Carnahan’s directorial follow up to 2010’s The A-Team. Oh, maybe that’s why nobody is talking about this movie. Carnahan’s resume includes writing and directing credits for The A-Team (46% on Rotten Tomatoes), Smokin’ Aces (RT score of 28%) and the screenplay credit for Pride and Glory (RT score of 35%). However, he also wrote and directed the gritty police drama Narc (RT score of 83%). So while Carnahan might be on a bit of a cold streak, no pun intended, he has proven himself an apt writer and director. As for the story, The Grey seems to fall somewhere between Alive and 127 Hours. 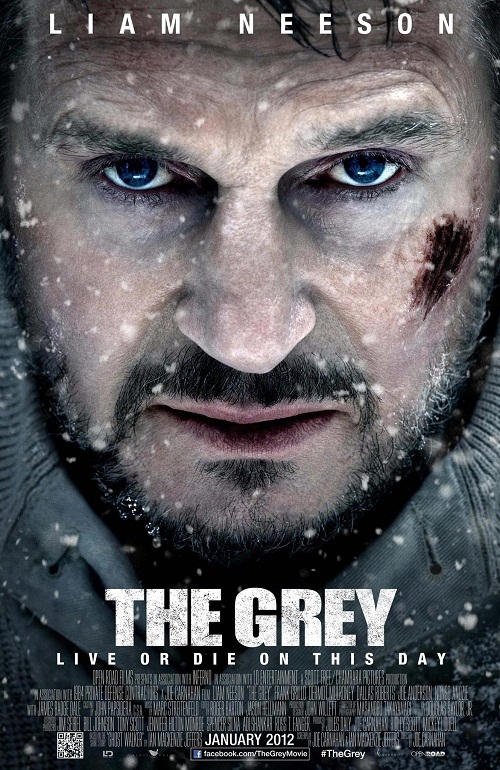 Liam Neeson plays a wilderness/security expert who must guide a group of Alaskan oil miners to safety when their plane crashes in the frozen wilderness. Cold, starvation, and wolves feature as the primary antagonists within the feature. I imagine we could add in the obligatory “guy who thinks he’s smarter than the actual smart guy”, to the list of foes. What would a survival movie be without that stock character sowing dissent and doubt among the group? Inevitable gimmicks of storytelling aside, when this movie is set against the sort of derivative schlock that Hollywood has been tossing our way as of late, its story seems downright innovative. That’s reason enough to be curious about The Grey. If The Grey’s attempt at originality is not reason enough to forgive Carnahan’s tendency to write and direct crap, there are a few more noteworthy factors in play. Consider that Sir Ridley Scott is listed as a producer. I can’t imagine the man who brought spectacle to twenty first century cinema investing in a losing concept. Also, the movie’s budget is listed at an estimated $34,000,000. It’s not peanuts, but it’s a far cry from the hundreds of millions that have gone into big budget flops. Call it wishful thinking if you will, but humble production costs tell me this isn’t going to be a special effects driven story. Ought we to hope that locations, physical sets and honest to god acting will carry the story? I think so. There’s a distinct feeling of legitimacy about Liam Neeson’s character and that’s just from the trailer. Of course, good editing goes a long way in Hollywood; for all I can tell this might end up like Sylvester Stallone’s seminal stuck on a mountain movie, Cliffhanger. For now, I’m happy to see another film joining the ranks of Contagion in its ability to remind us just how capricious nature can be when we are forced out of climate controlled buildings and into the reality of our world. Keep The Grey on your radar.